Every group associated with Earthdance must commit to giving at least 50% of their profits to a charitable organization. We are committed to this concept, and are in the process of selecting an organization. If you represent an organization that would like to be a part of what we are creating, please contact us. Rich released his first album Sunyata in 1982. Most of his subsequent recordings came out in Europe until 1989, when Rich began a string of critically acclaimed releases for Fathom/Hearts of Space, including Rainforest (1989), Gaudí (1991), Propagation (1994) and Seven Veils (1998). His two collaborations with Steve Roach, Strata (1990) and Soma (1992), both charted for several months in Billboard. Other respected collaborations include Stalker (1995 with B. Lustmord), Fissures (1997 with Alio Die) and Outpost (2002 with Ian Boddy.) Rich’s contributions to multi-artist compilations have been collected on his solo albums A Troubled Resting Place (1996) and Below Zero (1998). His group, Amoeba, explored atmospheric songcraft on their CDs Watchful (1997) and Pivot (2000). Live albums such as Calling Down the Sky (2004) and 3-CD Humidity (2000) document the unique improvised flow of his performances. Rich has designed sounds for television and film scores, including the films Pitch Black, Crazy Beautiful, Behind Enemy Lines and others. His musical scores grace films by Yahia Mehamdi (Thank you for your Patience, 2003) and Daniel Colvin (Atlas Dei, 2007, with 90 minutes of Rich’s music in surround); and a video installation by Michael Somoroff (Illumination, 2007). Rich works closely with electronic instrument manufacturers, and his sound design has filled preset libraries of Emu’s Proteus 3 and Morpheus, Seer Systems’ Reality, sampling disks Things that Go Bump in the Night, ACID Loop Library Liquid Planet, WayOutWare’s TimewARP2600, and synths by Camel Audio. Rich has written software for composers who work in just intonation, and he helped develop the MIDI microtuning specification. As mastering engineer and mixer, he has applied his ear to albums in all styles, and his studio was featured twice in Keyboard Magazine, and elsewhere worldwide. Since the late 1980s, Ghreg On Earth has woven a unique musical vision as DJ, A&R manager and Producer. His dedication and passion for an intelligent, gritty and moody musical journey, has forged a sound that is known for it’s timeless cinematic spaces that push the trance medium far beyond its formula parameters. Meshing, Blurring and Slurring wildly diverse stylistic elements into trance dancefloor alchemy, his sound has become synonymous with adventure in the unpredictable peak of sonic apotheosis. Ghreg’s debut full length album, Sigilweaver, stunned and lit afire the trance world with its release in Winter of 2005. It represents a new benchmark in sound exploration that continues to awe listeners and dancers hungry for a timeless journey through the outer regions and inner alcoves of deep nighttime soundscapes. Ghreg On Earth currently resides on the West Coast of North America (Earth) where he continues to create electronic music without boundaries…. taking the next steps into futuristic mythologies that conjure the sonic imagination of tomorrow. Aerosis was formed in the summer of 2006 by Goa Trance artists Bobby “Synogen” Ognyanov and Jeremy “Tempestuous G” Green and debuted the project on August 1st, 2006. Producing since 2004, the two talents convened at a site a site called ACIDplanet, and have been learning production from each other ever since. The first track the two created was Contorsion, and is also their first song to be released professionally, through their friends at Suntrip Records. Contorsion is the 2nd track featured on the Twist Dreams compilation. Alternately and individually known as Synogen (Bobby) and Tempestuous G ( Jeremy) the two are known to dabble in a wide assortment of projects, but have culminated into a steady (and looks like lasting) focus on Aerosis. Aerosis is working towards the completion of their debut album “Leap of Faith”, aiming to bedazzle the goa collective with a delighting tale of spiritual exploration. Distant System is an electronic music project that began in 2006, constructed by audio producer, Tyler Smith. Remote audio expansions designed and sequenced for cerebral migrations or active environments. Universal frequency dilation for macrocosmic chillout endeavors. Tyler has experimented with electronic music for over 10 years, and with the Distant System project, creates sonic textures and rhythms that engage and extend the experiencer. Androcell is an electronic / organic music project that began in 2003, created by audio producer, Tyler Smith. Tyler has experimented with electronic sound forms for over 10 years, but has been involved in music throughout most of his life, stemming from a piano, vocal, and percussion background. He designs his music as an aural habitat for cognizant chillers who seek to experience excursions through sound. KiloWatts (James Watts) is a quirky electronic experimenter of whom has released numerous tracks on albums with various labels. He’s also 1/2 of the glitchpop group KiloWatts & Vanek, and 1/2 of the Peruvian Amazon outfit ‘Skeetaz’ with Bil Bless. All in all, KiloWatts is a complex rhythmic audio editor that creates dynamic and unpredictable moods by interweaving an amalgam of experimental ambience and rich melodic structures. DJ NIKI is a co-founder and owner of Tokyo based psychedelic trance label Mighty Quinn Records. Together with his partner Toshi he has released two well recognized and respected compilations: “Royal Straight Flush” and “Beauty and the Beast”. In 2008 together with Spliffnik, another very successful compilation was born under the name of “The Invisible Hand”. Currently Niki is working on the next compilation for Mighty Quinn Records. Dj Niki has been Djing since 2004 and had played at numerous psychedelic parties. Getting a reputation as one of the most underground-psychedelic DJs around, he had shared the decks with artists such as Penta, Psykovsky, Osom, Jahbo, Kindzadza, Parus, Polyphonia, Dejan and Jellyheadz, Mussy Moody, Candy Power, Metallaxis, Drury Nevil, Savage Scream and many, many more. Dj Niki has acquired a full length and power mighty collection of music and presents a complete psychedelic story to the dancer on the floor, truly in the Mighty Quinn Records style. His sets are described to be perfect for any time of the party and are always smooth, rhythmic, mysterious, and create a perfect atmosphere for body and mind. Trancers and dancers are permanently put in a happy, easy going, relaxed state of mind throughout the set. Feel free to come and share this experience with DJ Niki. Boom! Random is San Francisco California native Ross DuBois a principal dj and producer of goa/psy-trance coming from the USA. He has toured the US, Canada, and Mexico extensively playing at festivals, clubs, outdoors, indoors, night time and day. “Implicate Order,” Random’s first full length album was released worldwide in 2006 on Geomagnetic.tv. With 15 + singles on labels like VaporVent, Geomagnetic, Timecode, Acidance, Kagdila, Shiva Space Technology, and many more. His music kidnaps the listener’s mind and sends it spiraling beyond space and time, it’s intelligent, crunchy, groovy and mind-expanding. Random’s flawless djing and psychedelic audio wizard has been zapping dance floors silly since 1996. The world is ready for this sensation to storm you to bliss! Known for his intense, sophisticated and high-energy sound, the Professor is a well respected dj in the Mid-West psychedelic music scene. The Professor is well-known for his captivating aura, attracting people onto the dance floors with his driving high energy orchestration of sound. Innovative and spontaneous, he reads a crowd and spins mental mayhem to amplify the energy on the dance floor, keeping crowds stomping well into the sunshine of the day. While constantly requested to provide boomin full on daytime sets, he has revealed an entirely original dark psy style which infuses higher resonancing. The Professor, A.K.A. Bradley John grew up in the Mid-West in a small town in Illinois called Normal. He started djing electronic music in 1998 while attending Full Sail recording school in Orlando, Florida. His first influences were progressive house and breakbeats. After working for Universal Studios as a live sound engineer for six years, he headed back to the Mid-West to find his roots. There he discovered psytrance in his hometown. Brad then began playing shows as a core member of the TRANCEPSYNDICATE under the dj name Professor X. Now The Professor is living in the rural desert outside of Phoenix, Arizona. He participates in events with local psytrance collective OVERMINDWORKS and visual artist eNdo. The Professor is also a featured artist at META enTRANCE, a psychedelic trance radio station and psytrance portal. Shaped by a “Do It Yourself” culture, Jeffrey Acciaioli was driven by his love of music to create the moniker The Great Mundane at first to only satisfy himself. Born and raised in Farmington Hills, Michigan he was exposed and later influenced by genres such as classical, jazz, bossa nova, hip-hop, and electronica. His broad range of favorites and training allow us to enjoy his “one of a kind” sound that is anything but mundane. The Great Mundane’s twisting textures, catchy drum whips, and unique soundscapes leave us with a melodic collage that is unlike anything we’ve heard before. The Great Mundane was first introduced into the Chicago music scene before taking his passion and energy nation wide. Soon international ears were falling upon his unique sounds and requesting his talents. Recognized and appreciated by his untraditional sounds, The Great Mundane worked with Belladonna Records to release two limited time EP’s and has released his debut album “When Falls Arrive” with Psymbolic–sounds. Paradigm’s reputation for pinpoint accurate mixing, smooth and clean equalizer work, dynamic and groovy bass-lines and infectious stage persona caught the attention of America’s psy trance scene, and has made him one of the most sought trance DJ’s in North America. Paradigm has been fortunate enough to share the stage with artists such as Wizzy Noise, Atomic Pulse, D-tek, Eskimo, Neuromotor, Hyper-Frequencies, Earthling, Dark Soho, Miraculix, C.P.U., Quadra, Astrix, Nomad, Paul Taylor (Spun), Shawnodese (Mind Funk), Arturo (Maia), Anneli (Sweden) and so on…and of course many if not most of the US based producers including Penta, Chromatone, Random, Deeper in Zen, Ghreg on Earth, Mubali and almost every other U.S. live-performance worth mentioning. The Primordial Ooze project was created by DJ’s Kaiser Soze and S.O.T. Flowing sounds that seem to bubble and evolve like primitive life forms. These bundles of frequencies collaborate in a swarm like manner, creating intelligent patterns and movement. The Ooze sound creates a unique twist on the ever changing sound of psychedelic music. // Featuring the award-winning multi-dimensional soundscapes crafted by the genius of Scott Rexroat, owner of Rexroat Sound – Moline, IL. Rexroat’s sound systems add an unsurpassed level of texture and complexity that leaves you entranced and perplexed while inducing de facto fixations into a pure psychedelic voyage. Sound rig designed by Rexroat Sound and deployed by PMLA. Full service Hookah Bar is provided by long time friends and supporters @ The Smokers Den – Bloomington, Illinois. The hookah bar is all-inclusive for our guests. This means that you will pay nothing extra to smoke from the 2 hookah bars all weekend long. They will have several other items for sale such as snacks, beverages, lights, glowsticks, CDs and more. “Phoenix Traders is Rockford’s imaginatively spirited importer of fine handicrafts and artifacts from planet Earth. We directly support the artisans with the belief that trade is a two-way street. We practice Fair Trade and we are constantly seeking products that enrich and improve the quality of life for both the artisans and purchasers of our offerings. We will be selling UV active batiks wall hangings of Indian Gods/Goddesses, Buddha, Om Symbols, and Wisdom Eyes from Nepal. Clothing from beach life like split front pants with mirrors, sarongs, Sun Dresses, Hemp clothing and Hemp bags. Incense and incense burners. And other fun stuff”. The Psymbolic Shop will be onsite all weekend. There will be fire spinning. Groups are encouraged to bring fire spinning materials if you can do it safely. Fire performances from Wicked Wicks, among others. We strongly encourage workshops, art installations, and lectures. If there is any sort of workshop or activity you would like to organize, please contact us. We will gladly help to accomodate in any way we can. We also encourage you to bring any deco you wish to display. The venue can accommodate just about anything you wish to bring. We encourage participation from everybody, no matter what you have to contribute. We will help you in any way we can and any staff member can point you into the right direction. Please contact us for more information. Workshops will be coordinated by JeffZ. Stay posted for more information. The highlight of the Earthdance event is a simultaneous link up, when every event across the world plays the Prayer for Peace. Morning in the Australian rainforest, midnight in London, sunrise over the Himalayas, and near twilight in Black River Falls, the Prayer for Peace is a profound and powerful moment that unifies our intentions for World peace and healing. Limited $50 pre-sales are available NOW! Gate price is $65 per person. 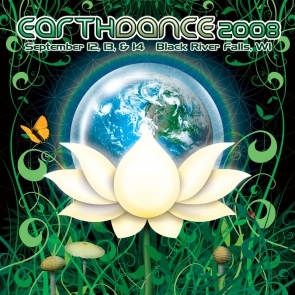 Please support the Earthdance cause and The Chilluminati’s efforts by pre-registering yourself and your guests today. Ticket prices cover performances, tent camping and parking for 3 DAYS and 2 NIGHTS, and campground facilities. Trailer camping is available on a limited, first-come first-serve basis. Electric/water/sewer hookups are extra for trailers. Inquire for details. Pre-sale ticket purchases are being offered by Psymbolic and The Smoker’s Den. You can purchase them online through Psymbolic with a valid debit card, credit card, eCheck or Paypal. To purchase in person, over the phone with a valid credit card, or with a personal check you can go through The Smoker’s Den. Personal checks must be received no later than August 31st to ensure that they clear. You may also pre-register with any Chilluminati member this summer. There is a September 10th pre-registration deadline, or 500 tickets, whichever comes first. IMPORTANT: NO THURSDAY ARRIVALS UNLESS . . .
Arrivals before Friday at noon will be turned away unless you are part of setup crew. Unless we have your names as part of setup, you will be turned away if you arrive Thursday. Contact crew (AT) chilluminati (DOT) org for details. THIS EVENT IS ALL AGES. However, you must be 18+ unless you are accompanied by a parent or guardian. Children age 13 and under are free with parent. YOU WILL BE REQUIRED TO SHOW ID UPON CHECK IN. Vendors wishing to set up shop are subject to a vendor’s fee (which varies. Please contact us), in addition to full price admission for them and their guests. Arrangements are NOW REQUIRED. You MUST contact us beforehand if you wish to vend onsite. Pre-sale purchases are being handled by Psymbolic. If you have questions, do not hesitate to contact us. You WILL NOT receive a physical ticket. Instead your name will be on our check in list upon arrival. (no registrations can be accepted before that time). From whatever direction you come, if you miss the “NCN Campground” sign you should also look for a tavern called “Grey Thunder”. It is directly across the street from the venue. I-90 W toward O’HARE / ROCKFORD: Over 200 miles. I-94 West toward Madison: Over 190 miles. I-94 West toward WIS DELLS: Over 110 miles. This is the second of two weekend-long camping festivals The Chilluminati will be creating in 2008. Both of our weekend festivals will be in western Wisconsin, close to the heart of the psychedelic tribes of that state and those of Iowa, Minnesota, Ontario, and Illinois. The Native Americans of western Wisconsin built huge sacred earthworks that we now know as effigy mounds. These immense earthen symbols, carved into the earth, were symbols of the Divine. Just as they built their mounds, we create these parties as Cosmic Condensates; our Music, Dance, Light, and Love form a sacred structure in Space and Time, a microcosmic celebration of the Infinite. WE PROVIDE: 2 stages of sound and light, 3 days of camping in a beautiful natural environment (rain or shine), running water, bathrooms and hot showers, full vending, including alcohol for those 21+, in addition to a full service restaurant onsite. YOU PROVIDE : a tent, enough food and beverages for the weekend (or some cash – food and beverages will be available for sale), NO GLASS, NO DRUGS, NO PETS, NO FIREWOOD (firewood can be purchased on-site).